This simple and easy recipe might be short on ingredients but it’s big on taste. 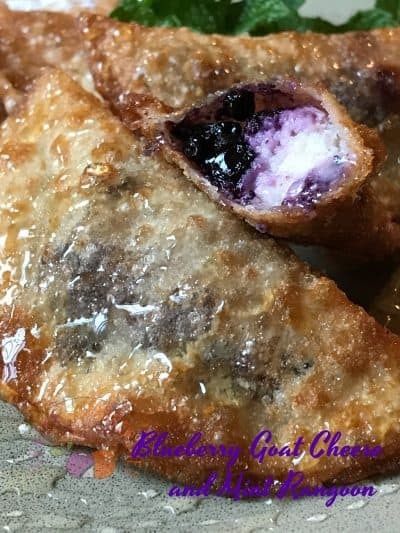 Made with only three ingredients, Blueberry Goat Cheese, Mint and Potsticker Wrappers. Rangoon takes only a few minutes to assemble and less than a minute to fry up crisp in hot oil. A quick drizzle of honey or a dusting of powdered sugar and you are good to go. Fast, easy and most importantly delicious! You can also substitute fresh basil for the fresh mint. I have entered this recipe in the Twin Dragon Asian Wrapper Blogger Recipe Challenge. This is the second of several recipes that I am entering. My husband was on vacation when I made the recipes for this challenge so he was my taste tester. He takes his taste testing job very seriously so I trust his taste testing abilities. He loved these blueberry goat cheese and mint rangoon and all the recipes I made for the Twin Dragon Recipe Contest. For this recipe challenge I received two packages of each; Twin Dragon Egg Roll Wrappers, Twin Dragon Won Ton Wrappers, and Twin Dragon Gyoza Wrappers or Potstickers. For more information about Twin Dragon and JSL Foods, stop by and check out all of their social media outlets to learn more. Asian wrappers can be found in most grocery stores refrigerated ethnic food section, ethnic food aisle or in the produce department. Use your favorite brand of blueberry goat cheese, such as Montchevre Goat Cheese. 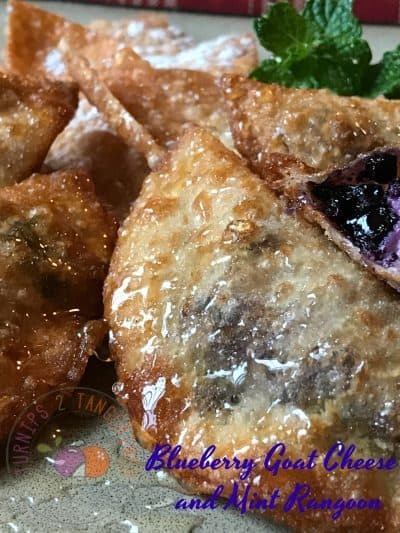 If you can’t find blueberry goat cheese, you can substitute blueberry flavored cream cheese or mascarpone cheese that has fresh chopped blueberries added. This recipe is all about simplicity. Simple flavors combined to make one delicious bite. Any rangoon are wonderful served as an appetizer with glasses of chilled white Moscato. This recipe is short on ingredients but big on flavor. 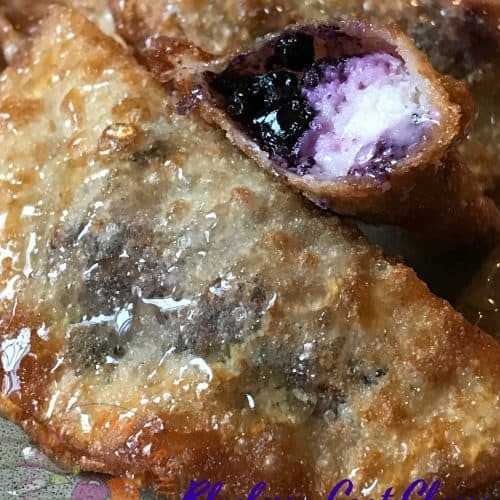 Use your favorite brand of Blueberry Goat Cheese for this recipe and Twin Dragon Potstickers Wrappers. Heat oil to 350 degrees in a large saucepan. Place a small amount of blueberry vanilla goat cheese in the center of each potsticker wrapper. Top cheese with a few strands of sliced mint. Moisten edges with water and seal. Fry in hot oil for 1 1/2 minutes turning in oil to cook evenly. Remove from hot oil, drain on paper towels. Drizzle with honey or sprinkle with powdered sugar. Serve. *For this recipe, you can substitute fresh basil leaves for the mint.